Michelle has been working in my studio for over a year now, and this year she has agreed to be a guest stamper and author on my blog! She helps with creating, prepping and lots of work in my office...and I'm SO grateful for her! She's wrapping up our Cookie Cutter Halloween week with a SUPER Adorable project! This week we are focusing on the Cookie Cutter Halloween Stamp Set. I made some 'Joy" home decor boxes not too long ago with the White Gift Boxes so today I made this set for Halloween! I love that they can be set vertical or horizontal. 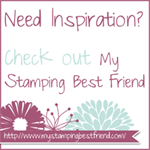 Michelle Litwiller is Ronda Wade's assistant and has been a Stampin' Up! Demonstrator since 2009. See more ideas on Michelle's blog Owl Star Stampers and in her email newsletter.